Sudan's Islamist government achieved a diplomatic coup when its former military intelligence chief, Gen Mustafa al-Dabi, was appointed to head the Arab League's observer mission to Syria. Sudan is a pariah in the West, where it is accused of sponsoring terrorism - it harboured al-Qaeda leader Osama Bin Laden in the 1990s - and of committing genocide against several ethnic groups in its Darfur region. Despite this, it has retained its credibility in Africa and the Middle East and has exploited the Arab Spring to its advantage. Sudan's President Omar al-Bashir welcomed the overthrow of Tunisia's Zine al-Abidine Ben Ali and said he gave weapons to rebels in Libya to overthrow Col Muammar Gaddafi in retaliation for the support the late Libyan leader had given to armed groups in Darfur. At the same time, the Sudanese security forces cracked down on pro-democracy protests in the capital, Khartoum, making sure that they did not threaten Mr Bashir's power. Now, the Arab League has appointed Gen Dabi, 63, to spearhead the mediation effort in Syria, another Western pariah accused of war crimes. This has dismayed human rights groups, with Amnesty International warning that it could threaten the credibility of the entire mission. "The Arab League's decision to appoint as the head of the observer mission a Sudanese general on whose watch severe human rights violations were committed in Sudan risks undermining the League's efforts so far and seriously calls into question the mission's credibility," it said in a statement. Gen Dabi served as head of the Sudanese directorate of military intelligence when Mr Bashir seized power in a coup in 1989 - a period marked by "arbitrary arrest and detention, enforced disappearance and torture", Amnesty says. His name was also linked with the summary trials and execution of 28 army officers who mounted a failed coup attempt against Mr Bashir in April 1990, an anti-government Sudanese news site, Alrakoba, reports. After his term as military intelligence chief, Gen Dabi headed Sudan's foreign intelligence agency before returning to the army to serve as the deputy chief of general staff in 1996. Syrian opposition groups have also expressed concern about Gen Dabi's strong military background. "He won't be neutral, and would sympathise with those in similar positions, thus it won't be surprising if he supports and sympathises with the Syrian regime and its henchmen who are committing crimes against humanity round the clock in Syria," said the head of the Syrian League, Abd-al-Karim al-Rayhawi. More recently, Gen Dabi has built a reputation as a diplomat and peace-maker in Darfur. 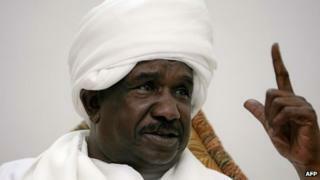 He served as Sudan's ambassador to Qatar between 2000 and 2004, and later as Mr Bashir's adviser on Darfur. After the conclusion of the Abuja peace accords between the Sudanese government and some Darfur rebel factions in 2005, Gen Dabi was appointed as commissioner of security arrangements in the ceasefire monitoring committee. He was also closely involved in Qatar's efforts to achieve a comprehensive peace deal for Darfur, though nothing came of the initiative. Some analysts believe that Qatar - influential in shaping the Arab League, and hostile to President Bashar al-Assad's regime - played a key role in Gen Dabi's appointment as head of the observer mission. "We know that Dabi has experience, and we think he will take this message of the Arab League [to Syria], and will be successful," a senior member of Sudan's ruling National Congress Party, Rabie Abdelati, told Reuters news agency. However, Gen Dabi's appointment has also been condemned on pro-Syrian government social media sites. On the Facebook page - God, Syria and Bashar - one user, named Mzs YR, voiced concern that Gen Dabi came from a country racked by numerous conflicts - and which split in June with the south declaring independence. "[Now] it's the fragmentation of Syria," Mzs YR said. But Arab League head Nabil Elaraby said Gen Dabi's "very wide experience" made him an ideal choice. "[The mission] is not an easy thing to do. It is something the Arab League was not qualified to do," Mr Elaraby told Reuters. One Sudanese official told the BBC that the Arab League had put Gen Dabi at the helm of the Syrian initiative because Sudan was a democracy, albeit a flawed one. "We have elections, and opposition parties in Sudan. Many other Arab states are governed by monarchies, and have no understanding of what the opposition in Syria wants," the official said.